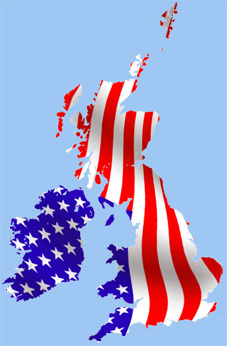 When I began writing a previous blog, I started by discussing the differences between US and UK scripts. This turned into, what seemed to be, an anti-American Rant, which was wholly inappropriate for that particular subject. However, it did give me an idea for another blog – this one. Before I begin, let me say that this is a rather tongue in cheek blog and not really meant to be anti-American. Hell, some of my best friends are American. However, certain things about literature and, especially, the internet really bug me. Yes, often I feel like the Americans have been trying to invade our literary shores for years. I’m not racist but… (insert your own racist comment that always follows that expression). As anyone who has ever had dealings with me will probably know, I do ride that high horse of anti-proliferation of Americanisms from time to time. Take, for example, on-line forms. Name – that’s okay; address line’s #1, #2. #3 – fine; City – no problem with that; Zip Code – WTF! We don’t have ZIP codes in the UK, despite what your American biased forms might indicate. Sometimes it even blocks you from entering anything that isn’t in the correct (by that I mean US) format thus excluding us poor Brits. The same online forms might have a drop-down menu for “State,” something else we don’t have. One can’t leave it blank, because the developer has chosen to castigate the form-filler for that. Oh, and then there are the choices for country. “United States” is always the default and top option. Where is the UK? Right down at the bottom, above the place where “United States” should be! It is Britain for God’s sake it should be near the top! And what about spellings? Okay, so they got “Aluminum” right – apparently it didn’t sound quite Latin enough for some scientists so the “i” was added so it became “Aliminium.” But I do get more than a little pissed off (you Americans can delete the “off” if you wish) at my MacBook that keeps trying to correct me because it is not the way Mirraim-Webster spells the word; and don’t get me started on clichés. So, yes, the Americans are invading our literary shores by stealth. They have contaminated our computer program(me)s with their distorted spellings; they are poisoning our authors with incorrectly structured words (E.L. James you should be ashamed of yourself); they are training up our youth with their un-grammatical television (excuse me!). Okay, end of rant. Yeah, I’ve had a good go at our cousins across the big pond but, hey, it’s all good fun. Some of my best friends are American! First, an apology. For those who were eagerly awaiting the fourth in this series, I am sorry. I’ve been so busy over the last month or so that the blog has taken a back seat. Well, here it is now. Better late than never! The one you’ve all been waiting for. 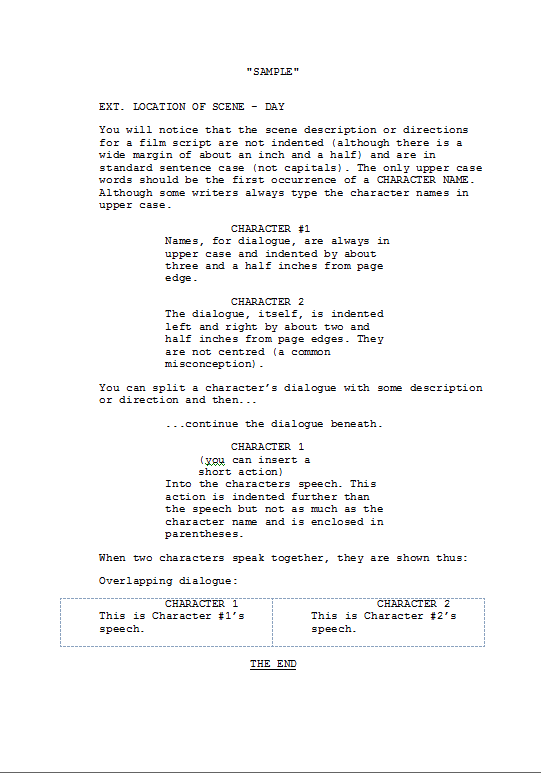 The truth about formatting scripts for film. Since screenplays (film scripts to the lay-person) seem to be all that are available online, then these are the ones that all writers know about. Or are they? The problem with finding screenplays online is that many of them are transcripts posted by well meaning amateurs (otherwise known as nerds) who may never have taken a writing course in their short lives. Now, I mistakenly wrote, in the first in this series, that US and UK screenplay styles differ. This caused me to go on an anti-Americanism rant in the first draft of this blog. On further study, I cannot actually see the difference. Oh, well! I’ll incorporate the rant into a blog about the subtle US invasion of the British Isles by weapons of mass misspellings at a later date. The screenplay. Margins are about an inch and a half from the page edge. The whole thing is typed in 12 point Courier or Courier New. This is easy for the readers/producers/directors to read unlike or whatever other fancy font you are particularly fond of. Such fonts would probably be the first indication that you are an amateur and cause your beautifully crafted but unreadable script to be dropped in the nearest bin. The script should not be left-right justified, either. Scene headings – unlike stageplays and radioplays, screen scene headings have a description. They always begin with INT. (for interior), EXT. (for exterior), or INT./EXT. or EXT./INT. (work it out). What follows is a short description of location. Examples – BEDROOM, KITCHEN, KIDS PLAYGROUND, etc. The end of the line is a dash followed by time of day, eg: NIGHT, DAY, MORNING, DAWN, etc. At the beginning of each scene is a scene description. Unlike stageplays and radioplays, this is in standard sentence case. It stands out because it is not indented. The description should contain as much detail about the scene and the characters as is necessary and no more. Don’t describe, in detail, the exact material of the character’s power suit unless it is absolutely essential for the character and is unusual. Never, never, never, ever, ever (is that enough) attempt to direct the actors, director-of photography or the editor in these descriptions. Descriptions like “XCU on pupil of left eye cross fade to bulls eye of dart board…” is a no-no. It is your job to tell the story, not to describe your artistic vision (unless, of course you intend to direct your own screenplay, which is a pet hate of mine). The first time a character’s name crops up in a scene description, it should be typed in upper case; there are debates about whether subsequent uses of the same name should also be capitalised or not, with some producers saying yes and some no. It’s up to you but be consistent. Character names for purposes of dialogue should, however, always be capitalised. This is for good reason – the actors (and everyone else) need to be able to spot the character with ease. These are not centred but indented, despite what most amateur writers do. Similarly, the dialogue is indented not centred – just not as much as the names. See the sample in the Figure #1 (click to expand). Again, this has been established over the years for ease of reading on set. There is a double space above the character name but only a single space between the character name and the dialogue. The dialogue is single spaced as are scene descriptions. There is a rather clumsy convention for writing overlapping dialogue. See Figure #1 again. The two speeches are written side by side in a 1×2 table. I think there are better ways of doing this but this is the convention so stick to it for now. The next scene will begin in the same way. Scene numbers are not usually employed by a writer although some will use them during the drafting/redrafting processes and remove them before submission. What about scene transitions such as “cut to”, “mash cut to,” “Dissolve to,” etc? (dramatic pause) Don’t! Again, it’s not your job despite what you will see in downloaded scripts. It is an editor’s job to decide how the scenes should change, not yours.